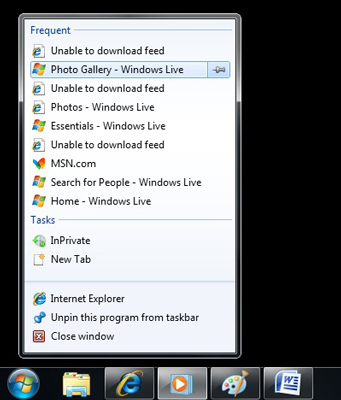 One of the big changes in Windows 7 is the redesign of the taskbar with its Jump Lists. You can use the Jump Lists like shortcuts to the files you use most frequently with an application. For example, the Internet Explorer Jump Lists shows frequently visited sites and the Media Player shows the songs you listen to most. You can even customize the files that appear in a Jump List. If you right-click any icon in the taskbar or Start menu and you’ll see a group of links — the Jump List. Although you can right click an icon to bring up the jump list, you can also click a taskbar button and then drag up. This touch screen technique makes the jump list fade in. The contents of the Jump List vary depending on the program that’s running. Here are some Jump List basics. The Jump List is divided into categories. The top pane shows pinned items that always stay on the list. The Recent pane shows recent file or activity history, and the bottom pane includes the name of the program and the entry Unpin This Program from Taskbar. Some Jump Lists also include one or more quick access commands. You can use it to view your recently opened file history or frequently viewed files. For example, the Word Jump List shows you the same Recent Documents list that appears inside Word. The currently open document(s) appear at the top of the list. Hold down the shift key and click the icon. Right-click the icon and choose the program’s name. You can use it to add or remove items from the jump list. To pin an item to the jump list, click to the right of an item and click the stick pin. Pinned items stay on the list regardless of how recently they were opened.